Municipal authorities in Bulgarian cities of Plovdiv and Russe have stood Monday in support of local operas and philharmonic societies, which are facing a cut-down as a part of reforms advanced by the Bulgarian Ministry of Culture. Plovdiv's mayor Slavcho Atanasov said that he would lead to Sofia a protest of Plovdiv musicians, artists and other citizens, should he fail to convince Bulgarian Minister of Culture Vezhdi Rashidov to give up a proposal to strip the city's Opera and Philharmonic Society of its opera functions. Similarly, the Municipal Council of Russe has gathered a working group which came up with a proposal to minister Rashidov to back down on his idea to merge the city opera house with its philharmonic society, thus virtually destroying the latter. This news comes amid looming discontent, reported last week, in Bulgarian theater and music circles regarding the proposed reforms in the area of theater, opera and philharmonic societies. Plovdiv is Bulgaria's third-largest city and the biggest in southern Bulgaria. The Danube city of Russe is the largest in the north-eastern part of the country, famed as a commercial hub in the XIX century and dubbed “little Vienna”. 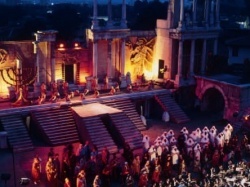 Both cities have a strong tradition and renown as centers of arts and culture in Bulgaria.